I recently got my order from All That Scraps. OH MY it took ages to get here! About 3 weeks!! I dont know what it is with the postal service, but packages from the US are so unpredictable, and so expensive! If its not duty & taxes, its the cost of shipping itself, or the length of time it takes for a package to get here! Well, out of the stash, I pulled out Apple Emma from CC Designs. Quite a while back, my talented friend Kadie sent me a set of CC Designs stamps. I had never tried them before and they sat in my room for some time before I dared ink one up. Well, since that day I have literally fallen in LOVE with the images! 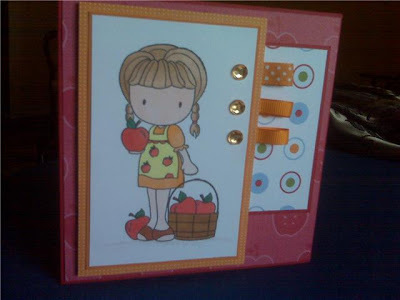 So when I saw Apple Emma, and knew I had some cute apple papers from stampin' up in my stash - I just had to have her. Of course, all bf could say was "she doesn't have a nose or mouth... how is she going to eat that apple?" to which I replied... "well obviously she's meaning to share the apples, not eat them!" Excuse the poor photography. A while back my computer went kaptuz and I can't download any new photos. So this one's from the Camera phone and we know how poor those pics turn out!! It really doesn't do the image or the papers any justice at all! But I had to post something since its been so long!! All papers and cardstocks are from Stampin' Up and the image is colored with Copic markers. Congratulations to the Men's and Women's Canadian Hockey teams for winning GOLD!!!!! WE STAND ON GUARD FOR THEE!!!!!!!!!!! This is so stinkin' cute, Karen! I love the CC Designs stamps, too, and the Emma, Nora, and Trevor's are my favorites!! This image is perfect with those papers! Good call, and great to have you back posting again! Oh, and I love the new look to you blog! Love the orange and ribbon tags on this! Totally adorable, Kare! Congrats on the CAN hockey wins! It was a great way to end a fab Olympics. She is just sooo sweet! Love the colors you used and great layout and embellies.